Ranked battle is a separate kind of random battle, players in which will be matched according to their skill. In other words, very strong players will not be able to get against (or together) weak players. You can participate only on machines of the 10th level. The main goal is to show high personal effectiveness. Top 3 players from the experience of the losing team will also receive prizes. The balancer will try to select players of the same rank. However, to avoid very long queues, players of different ranks will sometimes be selected. To obtain a new rank, you must fall into the TOP 12 winning team by experience or the TOP 3 loser, which will give chevrons. To get the first rank you only need one chevron. With each new rank will need more and more chevrons. 12 players lose the chevron team. 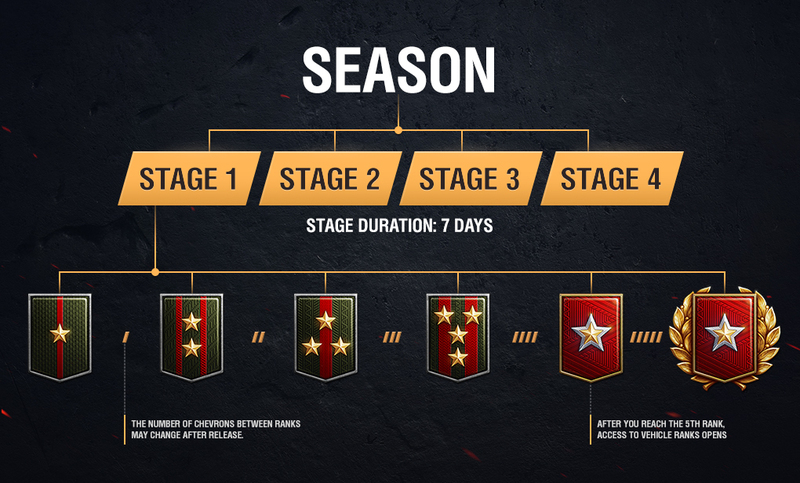 Rank battles will be conducted on seasons (1 month), each season is divided into 4 stages (each for 1 week).